I read that this card is not working good with the latest alexa_media custom component. Is it right? And if yes, how to fix it? I have problems with tts alexa platform as it always doesn’t work telling me it cannot use tts google platform. You would have to specify platform: alexa in order for tts to work with the custom “alexa/echo component”. 1 commits changed 2 files with 6 additions and 2 deletions. Echo Devices (Alexa) as Media Player - Testers Needed Share your Projects! @Richard_Gaunt: In addition to this setup, please note the mini-media-player may not actually support the latest version of the alexa_media component. I don’t know one way or the other. If it doesn’t, you’ll need to work with that team to fix it. They are using invalid configurations. Ogh, you said “telling me it cannot use tts google platform.” before, that’s why I thought you had an incorrect card config. Not sure, doesn’t look like anything has changed from reading the docs. I don’t see why it wouldn’t work, and I can’t test it since I don’t have any echos. Posted in the custom alexa component thread, and seems like at least this guy/gal got it to work. Just tested it. I’m on the latest version of this component and also your card. 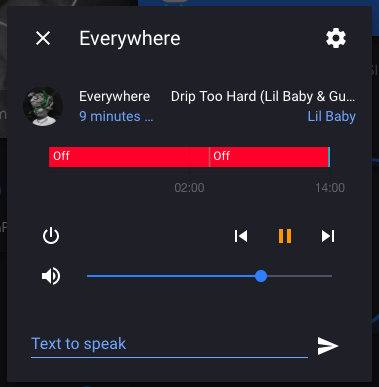 TTS works for me on my echo plus using the mini-media-player card. If i disable it all is working !! On my behaviour it works if i call the service directly from the dev service, but it doesn’t work if i try to call this from the frontend (i.e. from the card directly). I always get ‘failed to call media_player/alexa_tts service’. Can you post your config for the card (using the format button </> )? My experience with mini-media-player is this. language: it works only with Google TTS, but it’s not necessary. I get same language, italian, also if there isn’t this row. One main difference is that with Alexa media player the volume slider is alway active and the Power ON/OFF button does nothing, while with Google media player, the volume slider is available only if I turn on the device with the Power ON/OFF button. I don’t think Alexa as media player entities ever turn off, they instead go standby. You can use the idle view feature to kinda simulate on/off. There are a few options available for the idle_view object, but I think when_standby should work with Alexa as media player, check the card docs for other available options. trigger to do updates. For turning off, we can clear media_details. I just discovered the mini-media-player and well… well done. Now for us amateurs that use Amazon stuff (firesticks and echos), is there a way to get an “idle_view” for our devices that don’t go “idle” but go “standby”? Or is there a way and I’m just oblivious to it. I’m having an unusual issue with the media player card - added it to my configuration yesterday and to begin with it was working fine, however today instead of seeing the cards I’m just seeing a bit of text that either says ‘off none’ ‘idle none’ or ‘playing none’ depending on the state of the player. I’d like to use the tts feature in my media player card. This is my config and it works fine like this. As I don’t need the tts feature everyday it would be nice to only see it when I click on the player. Is that possible? Yes, skip the cards tts and use the tts input in the default more info popup, which you get to by clicking/pressing on the entity. EDIT: Haven’t got around to changing fonts yet, but tried adding ?v=0.01 to my url in the lovelace yaml - it briefly worked properly again, then I refreshed the home assistant app on iphone and lost it again. That’s strange, try replacing type: js with type: module, this is obviously not a viable solution if you are dealing with older devices. When I press the entitiy the pop up window doen’t include a tts field. No matter if a press the entity, the default card or your lovelace card. I guess the player has to support TTS. Otherwise, you could use popup-card and create your own popup. I also have the custom graph card installed, weirdly what seemed to happen before is when one was working, the other wouldn’t. Both behaving correctly now! Many thanks! It supports tts. It’s a alexa mediaplayer entitiy. Awesome, my cards are really built as modules, so importing as type: js could cause unwanted side effects. I’ve been experimenting with a new build process for the mini-graph-card, which seems to solve most of these issues.